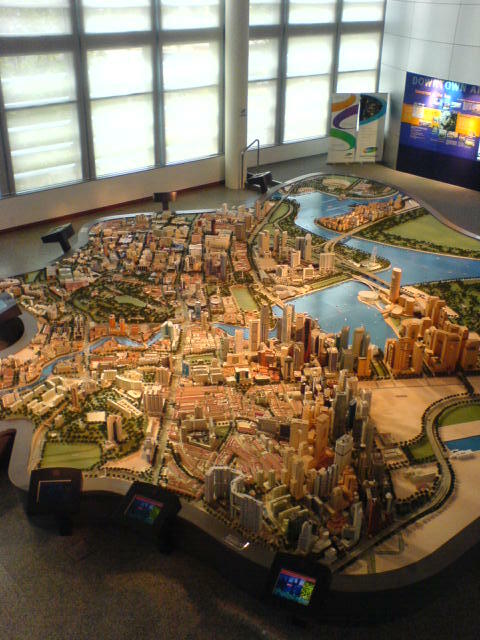 At Singapore’s Urban Redevelopment Authority (URA), the urban planners do it with models, too. Mohd Yazid, model-maker extraordinaire, has been crafting these scaled-down buildings for the past 30 years at URA. I just read about him on URA’s online magazine, Going Places. Friends who’ve visited me from other countries may have been taken on my Chinatown walking tour, which begins with the URA City Gallery, crafted by Mohd Yazid (now I know!). 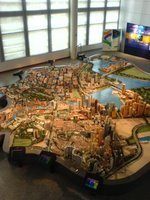 One of my favorite places in Singapore, the City Gallery shows a three-dimensional bird’s eye view of the city-state. There are models of buildings that are currently being built, and some that have not yet been built, showing what Singapore’s ever-changing skyline would look like in a couple of years. The detailing on finished buildings is really fantastic. Just before I moved here, my friend Hannah who was getting her master’s degree in urban planning from the National University of Singapore, took me to the City Gallery and showed me that hallowed room where Mohd Yazid works. I thought: wow, dream job! I wanted, wanted, wanted to spend my weekends there, carving balsa wood with my craft knife, prying my mighty-bonded fingers apart, and watching a building take form in mere days. To be honest, model-making was the part of my six years studying to become an architect that I enjoyed the most. My best friend used to rave about the URA Gallery when she was doing her master’s degree on urban design at the National University of Singapore. I didn’t understand her fascination with it until I finally went several months ago after an interview I did at the Red Dot Museum. I must have gone back four times since then, and each time I have friends from home (the Philippines) or abroad come visit me, I’ve brought and will bring them there. It’s a very good way to introduce Singapore to them, before taking them on walking and bus tours. Why do I like this museum chronicling Singapore’s growth and built environment so much? To me, more than the art and history museums the URA gallery is a living museum. Yes, it’s all about buildings and urban development, but it’s also about how this small country (it’s just about the same size as my country’s capital!) rose above its neighbors to become the sleek, well-designed place it is today. It’s about people giving character to spaces, a government making the most use of its resources, architects, engineers and planners building dreams. It’s a rags-to-riches story, if you want to romanticize it even more. It’s the big picture you tend to forget in the business of your day-to-day life, and when you see an inspiring big picture then the little troubles of your self-sustained world, like having your space bubble burst on the MRT (more on that later! ), melt away. The sad thing is, a lot of Singaporeans don’t know about the URA gallery. My best friend and I are Filipinos, and between the two of us we’ve probably been to the URA gallery about 20 times in the past two years. Then again, maybe it is because we are foreigners, and we come from an architecture background, that we like it so much. We don’t have anything like it back home. Not to mention, how awfully screwed up the urban design of Manila is, too. We learned in school that the plans for Manila were simply American architect and urban planner Daniel Burnham’s plans for Chicago superimposed on our very different terrain, and then halfway abandoned because we became “a country run like hell by Filipinos”. AND not to mention how very bleak our country’s big picture is. So I like the URA gallery. It proves to me that although Singapore is just beginning to explore its design and creative abilities (more on that later, too) now, it is a place where ideas do achieve three-dimensional form and where dreams do get built. But that’s just my perspective.